Many of us don’t run often. At FAHBG a lot of our running exercises are impeded by time constraints and the landscape surrounding the gym (a short strip of road on a slight incline.) When we do run it is usually not pretty. Josh, Mara, Abby and I went out to a local park last weekend and ran a 5K, a first for Abby and I. You can see our times on the Stats page, but generally it was an eye-opening experience. Running is difficult. And you have to be a real specific type of person to “enjoy” it. But, what if there were a way to make running more efficient? To minimize the physical impact and maximize the cardiovascular/muscular benefits? Well, my friends, there may be such a path. Take off your Nike cross trainers and let’s begin. Two different articles published today, linked below, introduce Daniel Lieberman, a professor of human evolutionary biology at Harvard University who proposes that barefoot could be a better way to run. The basis of his argument is that modern running shoes have conditioned the human body to run with the heel striking the ground, causing shock waves up leg and body with every step. 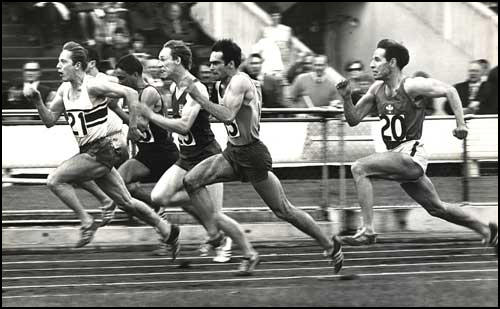 Comparing this style to some subjects in Kenya, who had run barefoot all their lives, Lieberman noticed that the Kenyans “were more likely to land on the front part or ball of the foot, and they adjusted their leg and foot movements so that they landed more gently on the ground.” Running on the front of the foot utilizes a different set of muscles in a different manner meaning it would take effort and re-conditioning to force ones body to do so, but can become a much more enjoyable experience, especially for those who have any ankle, knee or back pain. Check out the story on NPR with audio, or read it at The Independent. [UPDATE – Video interview HERE.] How about a FAHBG ‘trial run’? Feet-Only February anyone? Irregardless, I know what Abby is getting for Valentine’s Day. If you have already tasted the CrossFit Koolaid, then you know how we feel about intensity. To say we like it would be an understatement. Perhaps, you think, these crazy people just get off on throwing their bodies around – on the ground, on the rings, under and over weights of various shapes and sizes – and generally looking like a circus gone terribly wrong. Or maybe they just are in so much pain from their contortions that they want to get the hated workout over as quickly as possible. While both of those factors certainly come into play, there is actually some science behind our madness. It has been documented that high intensity exercise produces more of what we all want – aerobic endurance, anaerobic endurance, strength, fat-burning, growth hormone production, bone density, and overall hottness – and does so in less time than conventional methods of exercise. Mark is referring to our belief that chronic cardio – spending hours and hours spinning your wheels on an elliptical or pounding away on the concrete at moderate or low intensity – is a poor use of your time and may even be harmful in the long run. Cardio addicts have a hard time hearing that their beloved 6 miles a day is putting unnecessary stress on their joints and producing results that could be equalled or surpassed in 20 minutes with a kettlebell. So how can you get a taste of this infamous intensity? It’s incredibly easy. A Tabata workout consists of choosing an exercise that can be done to a maximum effort for a short burst of time – this can be cycling, swimming, rowing, burbees, squats, push-ups, pull-ups, thrusters, or the basic, sprinting – and giving a maximum effort for 20 seconds, then resting for 10 seconds, and then repeating 8 times for a total of 4 minutes. (Note: elliptical machines won’t work because they do not allow a maximum effort.) If you’re adventurous, you can select a series of 3-5 exercises, doing 8 rounds of maximum effort for 20 sec on 10 sec off for each exercise in succession. The key is the words “maximum effort.” With sprinting, it helps to imagine that a hungry tiger is behind you. Point is: run as fast as you possibly can each time. If you don’t think you can get a workout in 4 minutes, I urge you to try this. Run hard, take only 10 seconds for rest, and if you’re not tired, you should head for the olympics. If you’re reading this and you don’t already incorporate high intensity exercise, I urge you to give this a try. Just adding this in one day a week – maybe that evening you think you don’t have time to workout – can make a huge difference. You may look crazy, but it will be worth it.